This How-to guide covers all that you need to know about restoring a Microsoft SQL Server database, located in a backup set produced by NovaBACKUP Business Essentials using the MS SQL Database plugin method of backup, to restore that MS SQL database to an alternate folder location, to then be able to attach that restored SQL database's native MDF (Master Database File) and LDF (Log Database File) files as a complete database restore to a Microsoft SQL Server in your environment. Keep in mind that this method of SQL database restore does not necessarily require the target server to be the original MS SQL Server, however the SQL version and Service Pack level must match between the version of SQL that the database was originally backed up on and the target server. 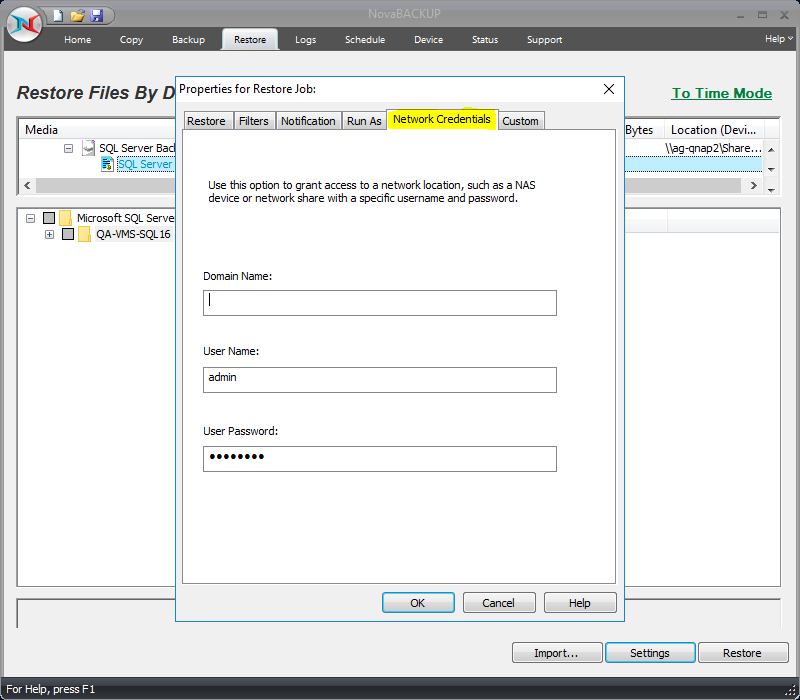 This method could be utilized for various situations where you had trouble restoring to the original location, the default method of restore, say if you had to build a new server from scratch or perhaps re-install Microsoft SQL Server application and the restore to original location now does not work for you, as well as you don't want to restore a single MS SQL database item such as one table from the database, which we have a tool for. 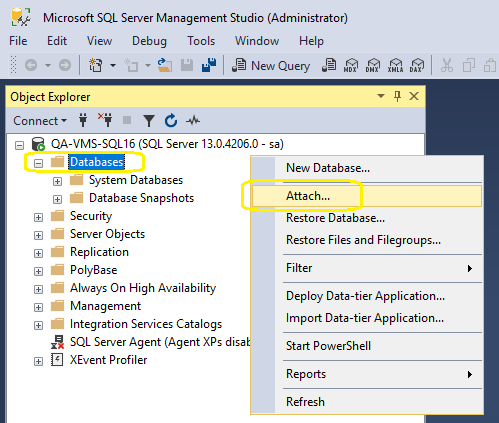 This method of MS SQL database restore allows for restoring the entire SQL Database to alternate folder using NovaBACKUP and then using Microsoft SQL Server Management Studio to attach those native MDF and LDF files as a MS SQL database to attach (restore) to the Microsoft SQL Server of your choosing. You can read about what an MDF and LDF file is in the third party article here. A caveat to using this method is that the Microsoft SQL Server that you are going to attach the database to has to match the version of Microsoft SQL Server that the MS SQL database was originally hosted under at the time of backup. Another caveat to using this method is that if this same named database already exists in Microsoft SQL Server that you are attempting to utilize the Attach function on to restore the native MDF and LDF files to that same named database will have to be detached first, it is advisable to read the guide by Microsoft that shows those Attach Database prerequisites here; Microsoft's guide on how to detach a database is here. The alternate folder restore method can be utilized to restore a MS SQL Server database that was part of a backup set to a specified folder where the native MS SQL database files can be extracted to. Those native MS SQL database files could then be utilized by a program like NovaBACKUP Granular Restore, for instance to be utilized to restore an individual table from a database and have that table be imported in to either a live database or a .bak format file. 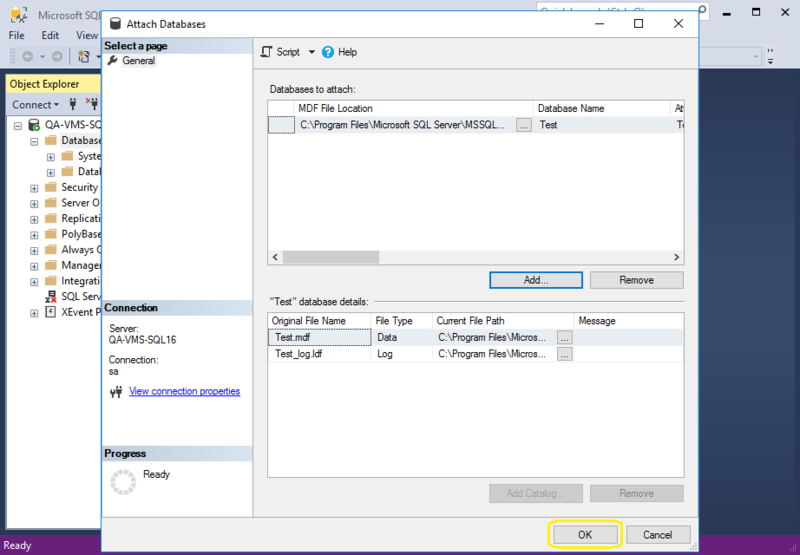 Compared to restoring to original location, as detailed in the guide here, this method allows for restoring a complete MS SQL database in to the Microsoft SQL Server of your choosing (as long as the version matches). NovaBACKUP Business Essentials contains native "plugin" capability to perform backups of Microsoft SQL, Microsoft Exchange, Microsoft Hyper-V Virtual Machines and VMware Virtual Machines. NovaBACKUP has requirements for the Microsoft SQL Server version to be up to date, we normally recommend the latest service pack and cumulative update that is available for MS SQL Server to be in place prior to performing a backup or restore of a MS SQL Server database. Make sure that MS SQL Server is up to date with the latest service pack and cumulative updates performed, normally Service Packs must be manually downloaded and applied so keep that in mind. There is a website that we utilize and recommend client’s use at the address here: https://sqlserverbuilds.blogspot.ca/. This website reliable shows the latest versions of MS SQL Server to be able to see all the release dates and direct downloads to the Service Packs and Cumulative Updates available for MS SQL. Your Microsoft SQL Server database should have restored to alternate folder successfully at this point, confirmed by the latest [Restore Operation] type of log entry viewable in NovaBACKUP's Log tab screen. 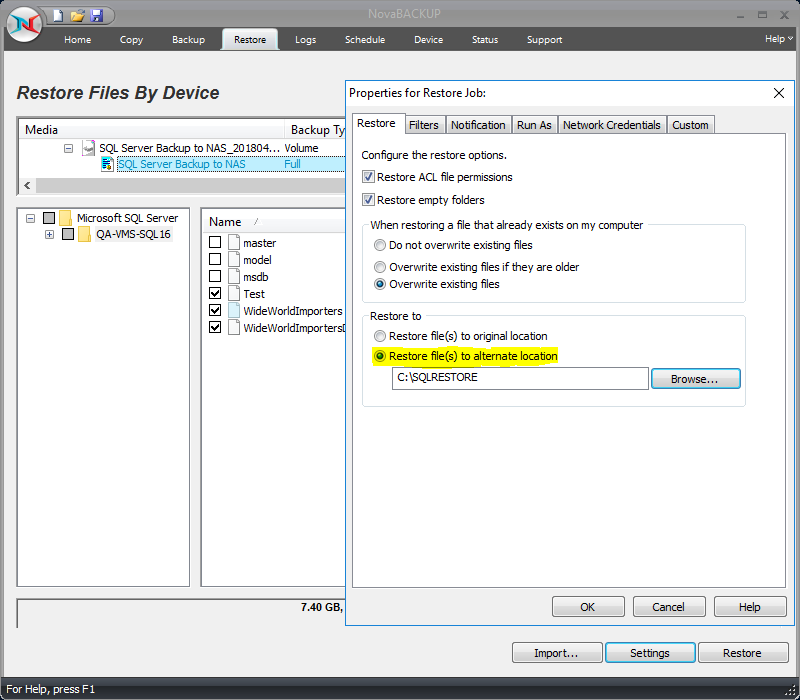 You will then navigate to the folder where you told NovaBACKUP to perform the restore to alternate folder to, in order to confirm that various files including the native database .MDF and .LDF file was restored. You will want to verify that the folder contents that you told NovaBACKUP to restore the SQL Database to alternate folder, contains an .MDF (SQL Database file) and .LDF (SQL Database logs file), otherwise you won't be able to continue. At this point you have verified that the MS SQL Server database has restored successfully to alternate folder using NovaBACKUP's Restore to alternate folder method, which outputs the MS SQL Database in its native MDF and LDF file format to then be able to restore that MS SQL Database in its entirety back to a Microsoft SQL Server running the same version and Service Pack level Microsoft SQL Server as the database was originally backed up as. 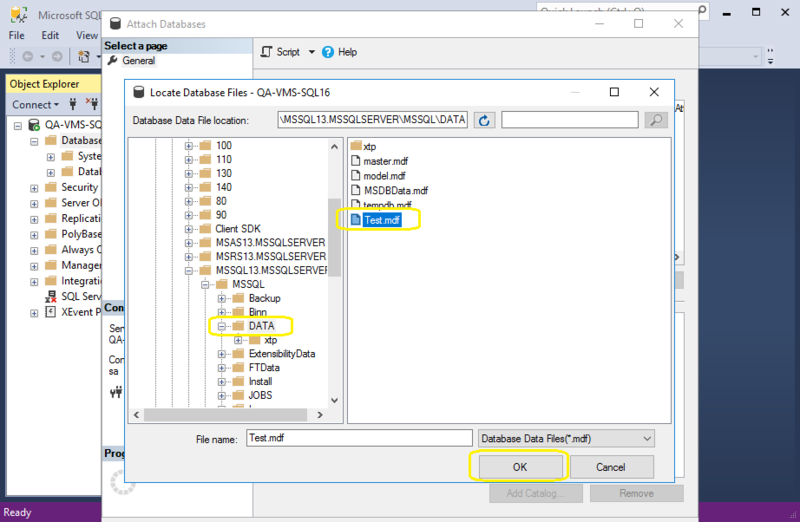 Alternatively you could at this point utilize the NovaBACKUP Granular Restore application to restore individual MS SQL Database contents, such as a single database table, in granular fashion using the alternate guide here. For those that would like to attempt to restore the entire MS SQL Database via the files that were restored to alternate folder, please continue reading. 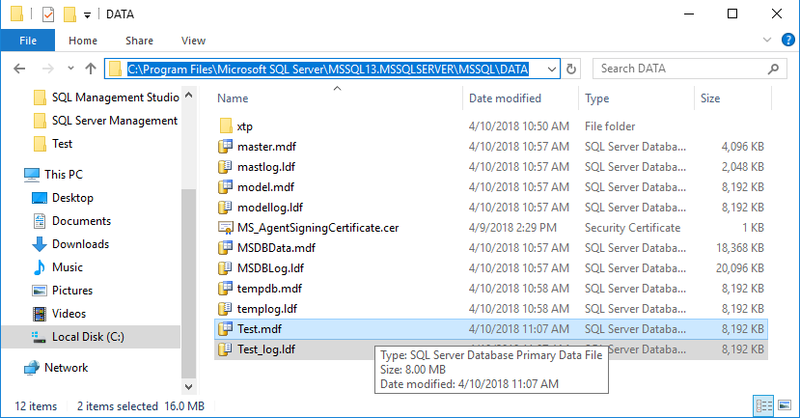 If you would like to attempt to Attach Database (restore) the entire SQL Database which was been restored to alternate folder using NovaBACKUP which produced native MDF and LDF files and Attach those native MS SQL database .MDF (Master Database File) and .LDF (Log Database File) files for the MS SQL Database that you are attempting to restore by utilizing the "Attach Database" function in Microsoft SQL Management Studio, you can follow the next steps. Keep in mind that in order to perform the Attach Database function the version of Microsoft SQL Server has to match the version of Microsoft SQL Server that the MS SQL Database was originally stored under. 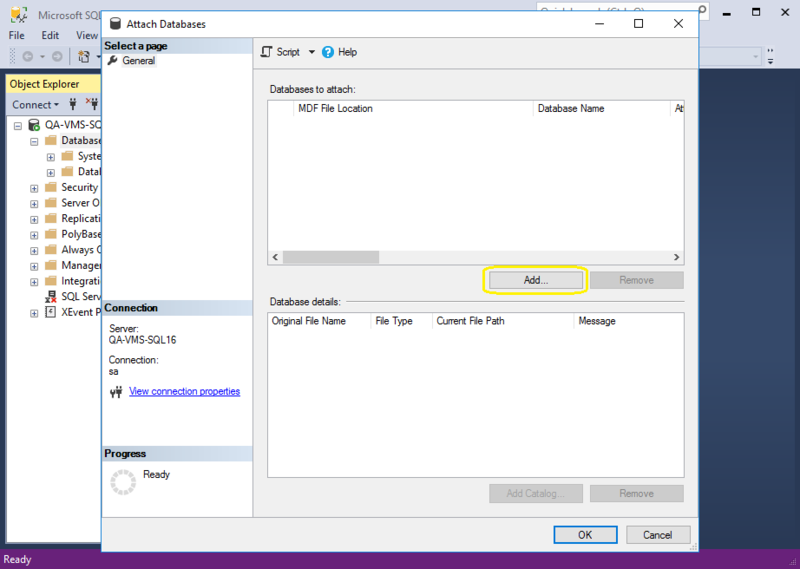 NOTE: A caveat to using this Attach Database method is that the Microsoft SQL Server that you are going to attach the database to has to match the version of Microsoft SQL Server that the MS SQL database was originally hosted under at the time of backup. Another caveat to using this method is that if this database already exists in Microsoft SQL Server that you are attempting to utilize the Attach Database function on you will be required to first detach the existing database first, it is advisable to read the guide by Microsoft that shows those Attach Database prerequisites here; Microsoft's guide on how to detach a database is here. 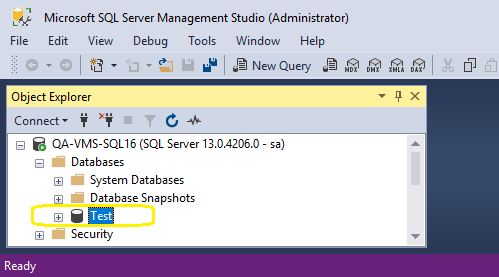 NOTE: Prior to attaching the MS SQL database using the Attach method be sure that the same named database does not currently exist in the "Databases" listing in the Object Explorer window. If it does exist you will have to delete it by right-clicking and doing a Delete. Otherwise the attach function will not work as the database already exists as the same named database. If the SQL database Attach function works successfully you will see it in the list under "Databases" in Object Explorer. 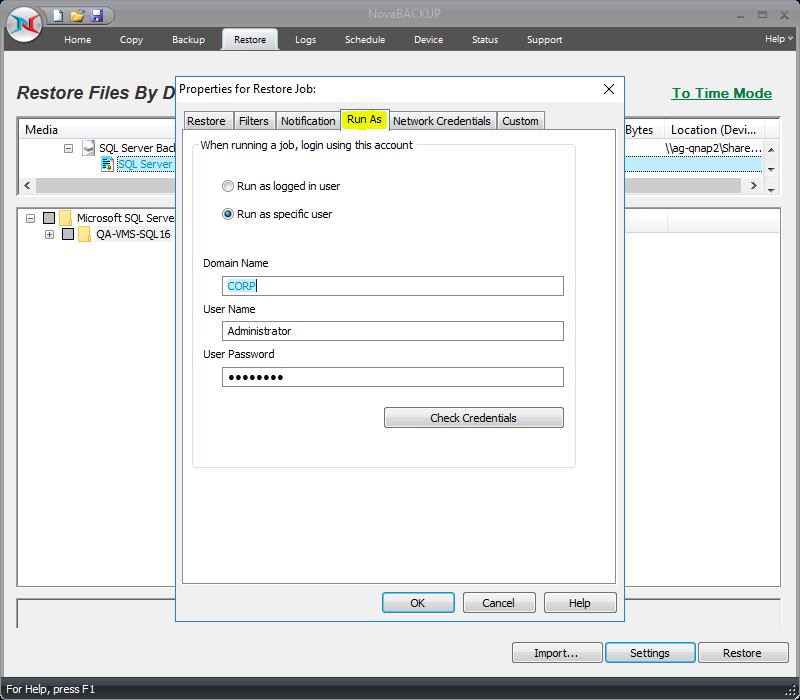 You should now be able to back up this database using NovaBACKUP, make sure that your backup job still contains the selection for this database that you just attached, you would have to exit out of NovaBACKUP if it is currently running to see the newly attached database be listed in the "Microsoft SQL Server" plugin section in the "Backup" tab screen.